The first Attack on Titan video game was an interesting one. Whether you loved or hated the Titans, the game had action sequences that captivated fans of the anime and manga.Despite it being a decent attempt overall, something just never clicked. Enter, Attack on Titan 2, a game that has addressed most of the issues from the first and added new features that were fun. Attack on Titan 2 doesn’t stray too far from the source material. This disappointed me, with the story mostly being a rehash of the events from the first game. The only difference is that you’re playing from a different perspective; by way of a custom character that you create as soon as the game begins. 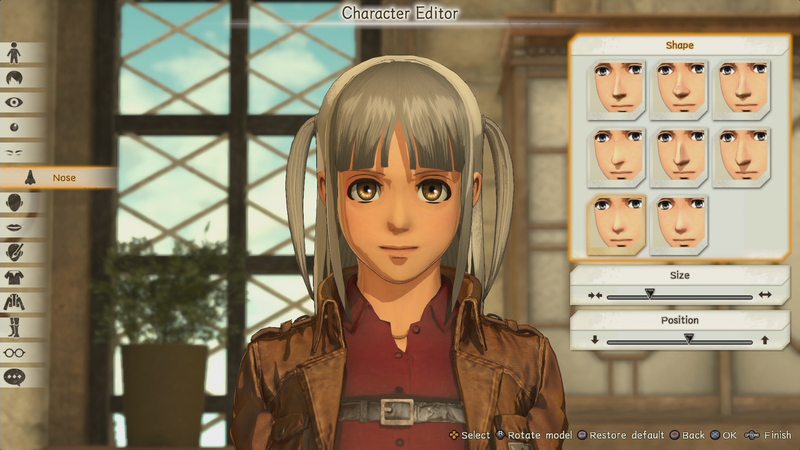 Featuring an in-depth customization system, you choose the gender, facial features, body, clothes, and more. I love when games let me create my own character. The limited options unfortunately put a damper on that. One of my main complaints with the first game was that the user interface was simply too busy and it obscured a lot of the screen. The sequel improves upon that, with Omega Force finding a way to provide the same amount of information in a more compact fashion. There’s still a lot going on and at times the sheer amount of stuff going on can be overwhelming, but you can see the screen, which is a positive. The story pacing is a bit weird as well. At the start of the game, you start at the point where you first encounter the female titan. After a brief scuffle, you’re tossed back into where the anime and the first Attack of Titan game starts. From here is where you create your character and you start your game. Thankfully, outside of that, the game does a lot of things well. A tutorial mode is integrated into the game, allowing you to get your bearings, including how combat works, how to use your gear and how to also command your squad for a number of different things. This is also a good opportunity to learn how to use your ODM (or Omni-Directional Mobility gear) as it can take a bit of time to figure out how to use it properly. But once you do, you’re going to love using it. Here’s where the game really starts to get fun. For me, there’s something about being able to fly through the air on your ODM. Performing super jumps and turns at breakneck speed, all the while trying to avoid the Titans as you latch onto them to perform attacks and bringing them to their death. Despite the cost of not performing my objectives and ultimately failing them, I enjoyed using my ODM way too much. Speaking of my not completing my objectives, this brings me to my next point: how missions are structured. You have your primary objective which needs to be completed during any mission. However, there are also secondary objectives that pop up from time to time, which give you greater rewards for completing them on top of your primary objective. These pop-up missions are optional, but you do stand the risk of failing the mission if you choose to focus on these secondaries over your primaries. The freedom is nice, but it’s easy to fall into the trap of getting wrapped up in the side objectives. Don’t worry though, you have a little back-up. Aside from you, you have a team of three AI-controlled characters that assist in your missions. Outside of that, there are other AI-controller characters who are engaged in other battles, all while you’re doing your own. It really ups the immersion that you’re really engaged in a struggle as you and your friends are holding on to dear life.Lastly, you’re graded on how well you do in the field. Performing attacks successfully versus having to do them over again until you get it right will hurt you. Getting hit by the Titans also affects your battle grade. Do well, and you’ll be rewarded with higher ranks and materials. Performing poorly will lower the rank and materials you get. Outside of combat, you have the chance to mingle with other characters, all of which are actual characters from the anime. Interacting with them will help you foster relationships, which in turn provide bonuses for when you do go into combat. You can also either upgrade your gear or do research to create newer ones. There’s also a new game featured called ‘Another Mode’, which prolongs the game. Here you’ll have access to online modes that let you team up with other players as you take down Titans, or race against them to take down the most Titans. You can also build new weapons, trade resources, and even respond to SOS requests (like in Monster Hunter World). 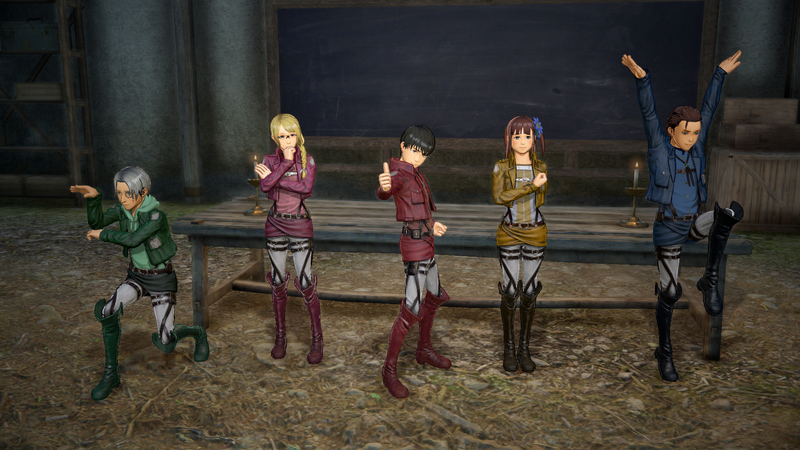 Attack on Titan 2 takes full advantage of the Xbox One X’s hardware boost, with performance staying consistently around 60 frames per second, whether in FHD (1080p) or UHD (2160p/4K) There were some frame rate dips every so often, but only when there was a need to draw a large amount of Titans and characters on the screen at once. It bears repeating that my main issue with Attack on Titan 2 is that the majority of the story is a rehash. You’re replaying the very same storyline from the first game, which follows the anime and manga. Only this time you’re playing a character who has been introduced for the sake of the game. Regardless, it’s quite the novel idea. Attack on Titan 2 is definitely a vast improvement over the first title. It’s slicker, faster and more engaging. While the addition of the ‘Another Mode’ keeps things fresh and the mindless combat makes for quick and enjoyable playthroughs. I definitely recommend it for fans of the series or for anyone looking for a fun game that has lots of combat. 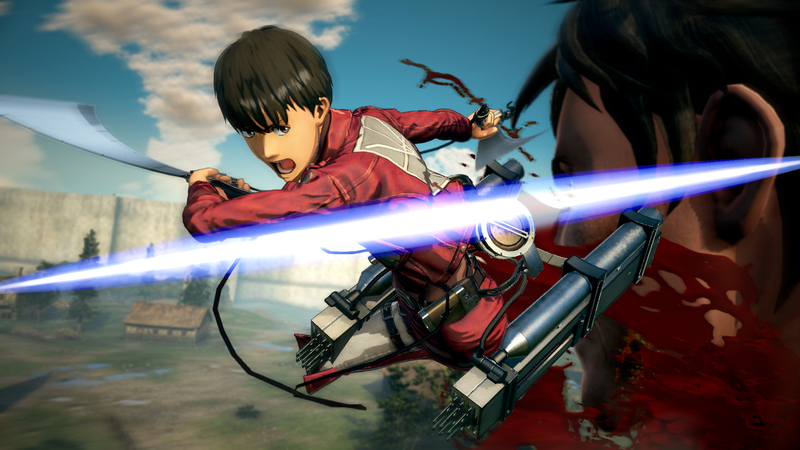 Review Disclosure Statement: Attack on Titan 2 was provided to us by Koei Tecmo for review purposes. For more information on how we review video games and other media/technology, please go review our Review Guideline/Scoring Policy for more info.